Even though it is commonly recognized as the August birthstone, peridot is also used for the 16th wedding anniversary. In ancient Egypt, peridot was considered a very spiritual stone that brought one closer to nature. To Egytian priests would crush up the stones and brew a strong drink to be consumed during ceremonies. quality peridot is mined in Mexico, Egypt, Australia, and the US. 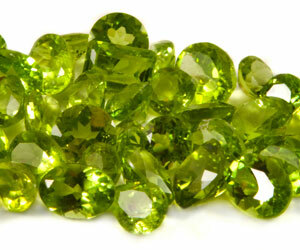 Peridot ranges in color from light yellow-green to intense bright green to olive.